A whopping 80% of American adults experience serious back pain sometime during their lives. Other orthopedic injuries due to falls, athletics or illness are a common part of modern life and interfere with our work, our recreation and our independence. When you have pain and immobility in the spine, arm or leg, you need help in regaining freedom of movement and freedom from pain. As licensed physical therapists with decades of experience, we use comprehensive hands-on techniques and proven modalities to treat all types of orthopedic conditions, be they surgical or nonsurgical. Our in-depth evaluation on your first visit helps us understand how your pain evolved and what makes your pain better or worse. We check your flexibility, strength, tenderness, skin sensation, posture, balance and gait and then create a customized treatment program based on our findings. MANUAL THERAPY is delivered by the therapist’s trained hands instead of a device. The goal of manual therapy is to place pressure on muscle tissue and mobilize the joints in an effort to decrease pain caused by spasms, tension or joint dysfunction. SPINAL STABILIZATION & PILATES strengthens the deep, core muscles that support the spine and help improve posture, function and athletic performance and prevent pain. We integrate Pilates mat exercises, Pilates reformer equipment and large therapy balls into our physical therapy treatment plans. Praxis’ Pilates Reformer Classes are available when you are pain-free. 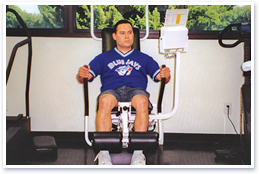 THERAPEUTIC EXERCISE targets specific goals. Every patient gets a personalized home exercise program, in writing and with pictures, designed especially for the individual. This may include balance and gait exercises and weights or elastic bands for proper strengthening.